The second issue of mono.kultur features German menswear designer Frank Leder. Setting up his own label while still a student at Central St. Martins in London, Frank Leder became known for his aesthetics that draw as much from German tradition and history as from contemporary issues. Combined with a sense for craftsmanship as well as a sense of humour, his clothes are accessible and yet infused with a very personal touch: you might find little items that once belonged to his father in the pockets, or collar stiffeners cut out from his favourite vinyl record sleeves. 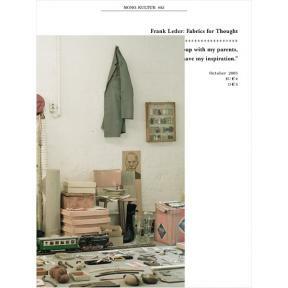 In that sense, Frank Leder is as much a story teller as he is a fashion designer. With mono.kultur, Frank Leder talked about rediscovering his roots, how to set your own rules within an industrialized fashion business and the importance of honesty. For this issue, we documented a trip to the hometown of Frank Leder’s father in Bohemia.